Office of the Superintending Archaeologist, Archaeological Survey of India, GNB Road, Ambari, Guwahati- 781001. New Kalibari, Bamuni Pahar, Tezpur, Distt. Sonitpur, Assam- 784001. Dimapur Rajbari, Distt. Dimapur, Nagaland- 797112. 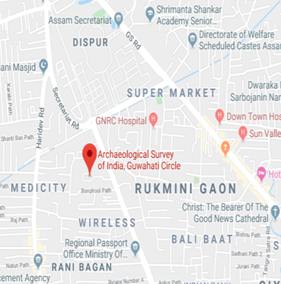 Archaeological Survey of India Guwahati Circle.